The surface plasmons are electromagnetic waves, which are confined near a dielectric/ metal interface. The transverse MO effect can be significantly magnified in the case of the surface plasmons. Fig.1 Distribution of optical field of a surface plasmon and a mode in hybrid waveguide. The surface plasmons are very similar to waveguide modes. If the waveguide mode is confined in a dielectric layer (waveguide core layer) of higher refractive index, which is placed between two dielectric of lower refractive index (waveguide buffer layer and waveguide clad layer). A surface plasmon is confined at a dielectric/metal interface. Figure 1 compares the optical field distribution of a surface plasmon and the field distribution of waveguide mode in hybrid waveguide. Since in the case of plasmons a larger amount of the optical field is inside the metal, in general the optical loss of the plasmons is larger than optical loss of waveguide mode in the hybrid waveguide. A part of optical field of a surface plasmon is always inside the metal, therefore the plasmons always experience optical loss. The more optical field is inside the metal, the larger optical loss is. In wavelength region (lambda> 600 nm) the main source of optical absorption in the metal is free-carrier absorption. Therefore, in the metals, which have smallest resistance, the plasmons experience the smallest loss. The most famous low-resistance metals are copper and gold. The plasmons in these metals have very low optical loss. From Fig. 1, 1/e plasmon propagation distance in gold and copper can reach almost a half of millimeter. 1/e propagation distance is a distance, at which amplitude of electromagnetic wave decreases in e-times. 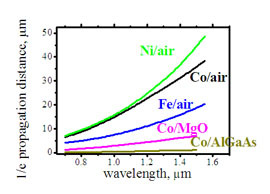 The ferromagnetic metals, like iron, cobalt or nickel, have significantly larger electrical resistance. 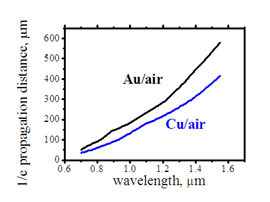 Therefore, the plasmons in these metals have about 10 times larger optical absorption than in the gold or copper (Fig. 3). From Fig.3 it should be noticed the dependence of plasmon's optical absorption on the refractive index of the dielectric. In the case when the dielectric is air, which has the lowest refractive index =1, the plasmon's propagation distance is the longest. In the case when the dielectric is AlGaAs, which has the largest refractive index, 1/e propagation distance is very short. It is only about few micrometers. The reason for the dependence of plasmon's optical loss on the refractive index of the dielectric is the following. The exponential decay of optical field in the dielectric is faster for the dielectric with the higher refractive index. For plasmons in a structure with dielectric of higher refractive index, there is a smaller amount of optical field inside dielectric and respectively a large amount of optical field is inside metal. Therefore, a plasmons in this structure with dielectric of higher refractive index experiences larger absorption. 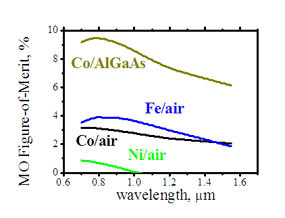 Fig.4 Magneto-optical figure-of-merit for plasmons in transition metals. The surface plasmons in transition metals have significant optical loss, but the transverse MO effect is also significant in this case. The problem of the high loss can be solved by shortening the device length. For MO applications it is important that even for the short device the magneto-optical effect should be significant. Therefore, absolute values of optical loss or MO effect are not as important as a ratio of magnitude of MO effect to the optical loss. The magneto-optical figure-of merit is a ratio of magnetization -depend loss to total optical loss. This value well characterizes the efficiency of usage of MO effect in a practical device. From Figure 4, the MO figure-of-merit for plasmons in transition metals is about 4%. It is about the same value as in the case of waveguides modes in a hybrid waveguide. It is worth to notice that in the case of the dielectric of the higher refractive index, the MO figure-of-merit is higher and can reach about 10%.